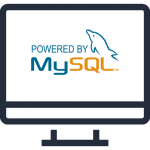 MySQL is recognized to be one of the finest open source database management solutions that technically support nearly all the development languages and the operating systems in the industry. It is amongst the most used and highly accepted databases for different application development solutions and has thorough documentation along with a well-built support community. MySQL is swift, consistent and straightforward to use having multiple purposes. This database is most excellent when used in combination with applications developed in PHP and is an integral part of the LAMP stack. MySQL is very simple to install and can be utilized by all who have fundamental SQL skill-sets. It gives best outcomes used with any application. It is highly recognized for its powerful compliance capabilities, multiple versioning and distributed transactional potentials. It is extremely secure platform which comes with safe password encryption and privileges adding a strong protection. It is undeniably a favourite tool for web developers due to its affordability than any other tool in the market. It can manage any quantity of data and can be tailored to handle more amounts of data. Need MySQL experts? Contact Us Now!